fRom THE SAmE nuClEAR oozE THAT bRougHT you THE ToxiC AvEngER EmERgES THE glowing SACRED TRASH! THiS bAnD SounDS likE A gARbAgE TRuCk Runnng on muTAnT blooD bARRElling THRougH THE STREETS of nEw jERSEy, RowDy punk RoCk AnD Roll AT IT'S finEST. you EiTHER gET IT oR youR boDy will bE founD in THE boTTom of THE nEw yoRk STATE lAnD fill! CHuD DESCRibES wHAT iT'S likE To TAkE A miDnigHT DRivE ARounD Town DoDging zombiES! THEy wAnT mE, wAlking DEAD! 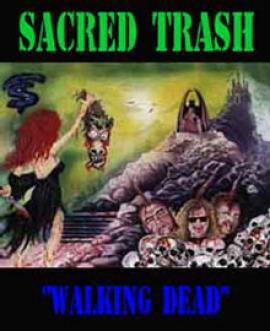 Copyright 2003 SACRED TRASH . All rights reserved.